Click Here to view the June 2018 Newsletter. Click Here to view the October 2014 Newsletter. Click Here to view the August 2013 Newsletter. Click Here to view the December 2012 Newsletter. Click Here to view the August 2012 Newsletter. Until recently, Exotic Flames was all about FIRE. 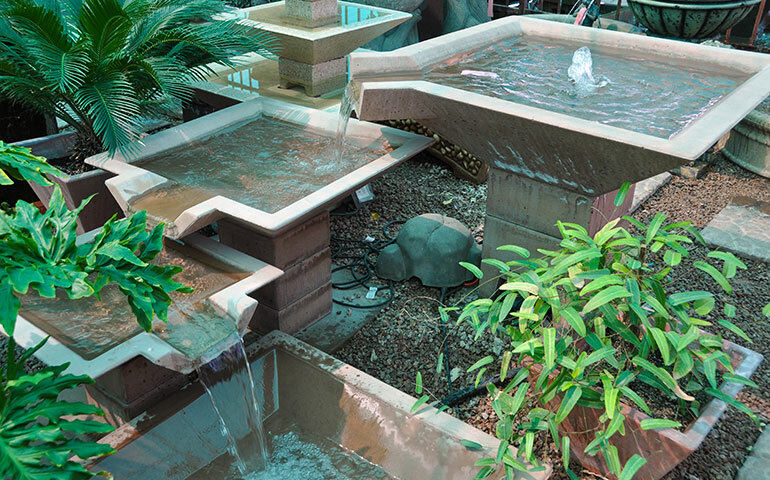 Since we have been asked about water features so many times, we decided to add fountains to our product line. 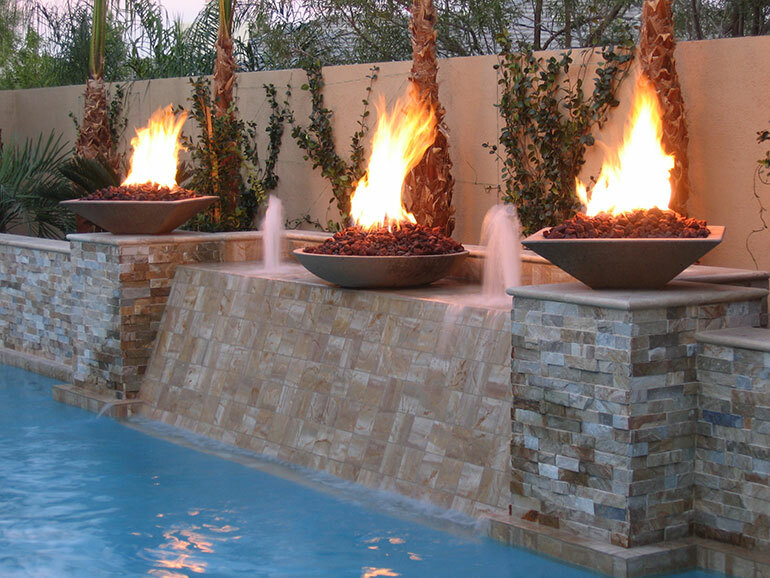 Exotic Flames offers you a selection of three fountain designs. These kits include the water pump and there is NO ADDITIONAL CHARGE to ship them to your location. 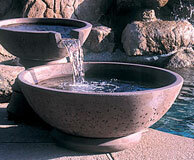 These Fountains are built as they are ordered. Therefore, processing time is normally 12 to 14 days before they ship. Standard ground freight is included to anywhere in the continental US, excluding Alaska, Hawaii, and Puerto Rico. If you are purchasing other products at the same time, you will see freight options only for those items. These Fountains are limited to Standard Ground Freight only. Our new line of Water Scuppers are sure to be a hit. 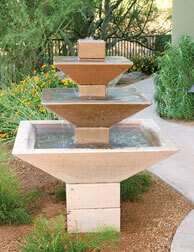 Create your own cascading Scupper design. 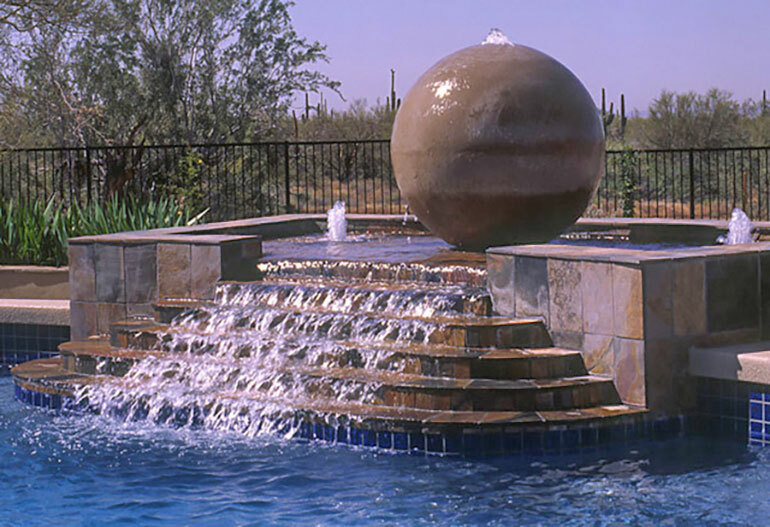 Add your own water pump for a free-standing design or tie into your pool filtration system to create a poolside masterpiece. On our Exotic Flames Facebook Page, we will soon be running a sale on these products. You must "Like" the Facebook page in order to see the coupon codes. 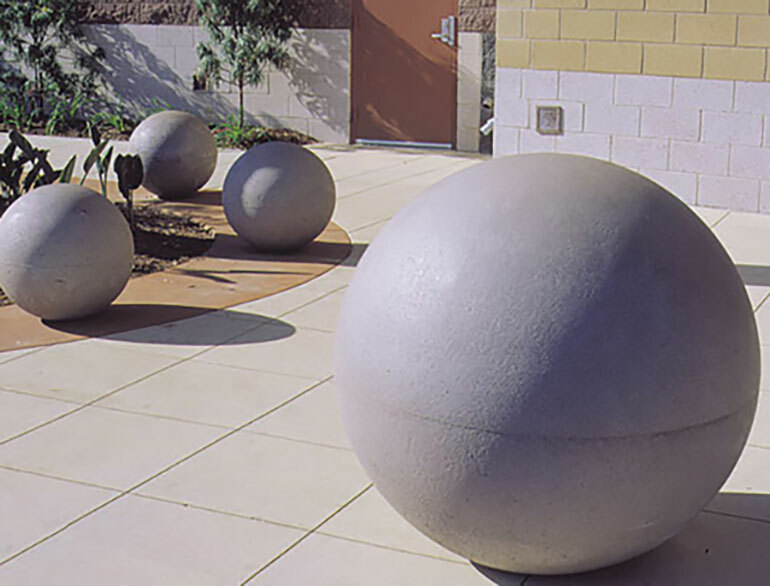 For Barricades, Landscape Enhancement, Fountain Centerpieces. Click on the pictures to be taken directly to these products. Automated Tiki Torches are one of three exciting new products in our line up. 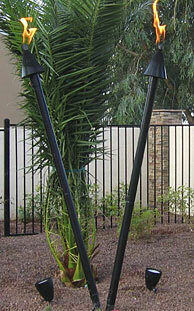 Exotic Flames offers you a selection of (NG) Natural Gas or (LP) Liquid Propane tiki torches with different crown designs. 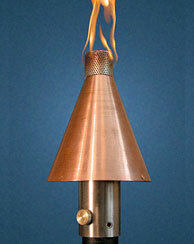 If you are looking for a permanent mounted tiki torch or a portable tiki torch, we have what you are looking for. Built with quality craftsmanship and a powder coated 2-1/2'' metal pole, 96'' tall with crown, you will be satisfied with your choice of any tiki torch we offer. Convert any of these tiki torches into a fully automated, remote controlled system and with the push of a button turn them all on at the same time. No more oil to fill or mess to clean up. No more dealing with the wind blowing them out and having to re-light them again. Our automated tiki torches are the best in the market and deliver the reliability you expect from an automated system. These tiki torches come with the following options; manual, push button spark light, or fully automated. Exotic Flames offers a newly designed automated remote control module, the RCM 1. This power pack gives you the ability to operate your fire features from a central location. The size has been reduced in order to fit it into smaller locations and the performance has been increased to deliver dependability, reliability and guaranteed results. One push of a button and you can control your outdoor fire features without the worry of wind blowing them out and having to re-light them. A perfect solution if you have multiple locations that may be too high or out of reach. The 240,000 BTU, 24 volt wired system allows you to install this system with ease and low cost. The best part is that they are made in the USA. Click on the pictures to the left to be taken directly to these products. You wanted it so ICS created it! A quality turnkey fire pit with contemporary lines! 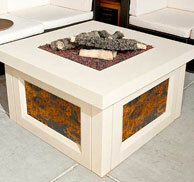 The additional customization available for this fire pit makes it extremely versatile. The side panels can be left plain, or graced with your choice of copper or stone veneer for an additional cost. 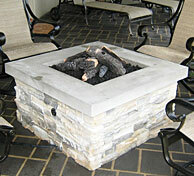 The fire pit serves as the centerpiece for the deck or patio both visually and socially. Concrete offers a unique role as a strong mediator to bring out the best features in complimentary materials such as stone veneer and decorative copper accents. These materials are easily applied within the recessed beveled inserts fusing them together in a dramatic marriage of texture and shape. Or, if leaving the inserts unadorned, it renders a sleek, contemporary flavor to the fire pit. This fire pit includes everything you need (other than a propane tank if you plan to use propane). It even comes with a vinyl cover to protect it from the elements. With a choice of several finishes and inserts in addition to hundreds of dollars less than the manufacturer's suggested retail price, this fire pit is a smart buy! For use with natural gas or propane. Forget the Newsletter! Why don't you go take a look at it right now? Click Here to be taken directly to the Shopping Area. Then scroll down to see all the images. You also asked about ROUND! Just as exciting, a round model is currently being developed and will be ready for production within a few short weeks. 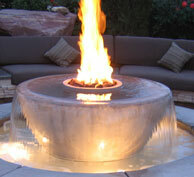 Quite often, we are asked if any ICS fire pits come in a round shape. 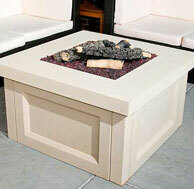 With the introduction of a round fire pit, there will be an ICS fire pit that will fit into any decor. The ICS line of fire pits are high quality. 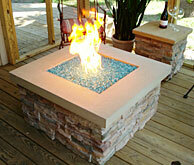 For that reason, it is the only line of turnkey fire pits we carry. We have sold these fire pits to up scale businesses, such as the Ritz Carlton in Naples, Florida and PF Chang's in Massachusetts. So rest assured, you are getting what you are paying for. At last! A multi-purpose fire pit that is built like a tank! It looks like it was custom built "on site", but can be assembled in a mere 20 to 30 minutes! ICS (Interlock Concrete System) has developed a clever, functional and beautiful alternative to having a fire pit built from the ground up. The groutless, stone-veneered, interlocking blocks make setup simple and quick. Disassembly is just as quick and easy. Since this is a pre-fabricated fire pit, you can take this with you when you move or change the location of the pit as needed. This fire pit includes everything you need (other than a propane tank if you plan to use propane). It even comes with a vinyl cover to protect it from the elements. With a choice of several finishes and inserts in addition to hundreds of dollars less than the manufacturer's suggested retail price, this fire pit is a smart buy! 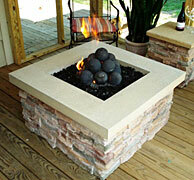 This ICS Fire Pit is built with your choice of insert. Insert choices are Glass (FireGlass), FireBalls or Artificial Logs. 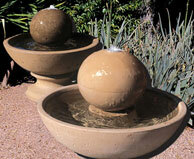 Fast and easy assembly/disassembly with your choice of four stone finishes and two cap finishes. For use with natural gas or propane. There is some very good news on the way. A burner for a ventless fireplace is finally being designed. This burner is being designed to be used with FireGlass and will hopefully be shipping in 3 to 5 months. The setup will be similar to that of the Propane burner setup (instruction manual found here. On a daily basis, I get asked if there is a burner system developed for FireGlass. Needs create products - that's for sure. Let's keep our fingers crossed that these burners will be shipping within the estimated time frame. For the folks that are unfamiliar with what a ventless fireplace is, let me elaborate. It is simply a fireplace that has no flu. The fireplace burner is regulated for a low BTU rating. If the BTU rating is low and the fuel burns cleanly enough, there will not be a build up of dangerous levels of carbon monoxide in the room. Two additional benefits of ventless are that they are the most heat efficient and can be placed almost anywhere in a room. Please keep an eye on the website for the latest developments. I want to tell you about a new book that I have the privilege to be a co-author in. The book is titled “101 Great Ways to Improve Your Life: Volume 3”. It is a compilation of 101 articles with practical, solid advice on how you can finally take action and improve your life. 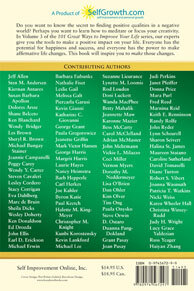 I am extremely excited to be a part of this and am equally excited to be a contributing author along with Ken Blanchard, Les Brown, Mark Victor Hansen, Byron Katie and many other leading Self Improvement experts. This book was created by David Riklan, the president and founder of the #1 Self Improvement website in the world, SelfGrowth.com. He tapped into the minds of the greatest experts of our time and pulled together something that will blow you away. It's a complete collection of 101 insider secrets that can show you how to instantly and positively improve your life! 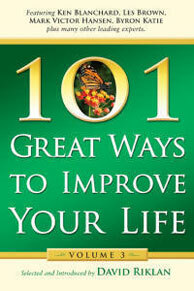 This book is the third volume in the “101 Great Ways to Improve Your Life” Series. For those of you that have not seen Volumes 1 & 2, David is also offering a special discount if you purchase the three volume set together. Volumes 1 & 2 include more great secrets from Zig Ziglar, Brian Tracy, Jim Rohn, Jack Canfield, Dr. Richard Carlson and many other leading experts. David has also bundled the book with life-enhancing tools! He calls them “bonus gifts” and he has created a package of $1,500 worth of absolutely free gifts that you get by purchasing just one copy of our book. These bonus gifts aren't the typical items you may have seen in other campaigns. That I can guarantee! Every single one of these gifts has enormous value and has been cleverly created to give you value beyond anything comprehensible. David is so confident you will love it that he is backing it up with a completely solid guarantee.